NEW BOTHWELL, MB (December 20, 2015) – Bothwell Cheese (Bothwell), in coordination with CFIA, are recalling certain Bothwell shredded cheese product due to the possible presence of Listeria monocytogenes. 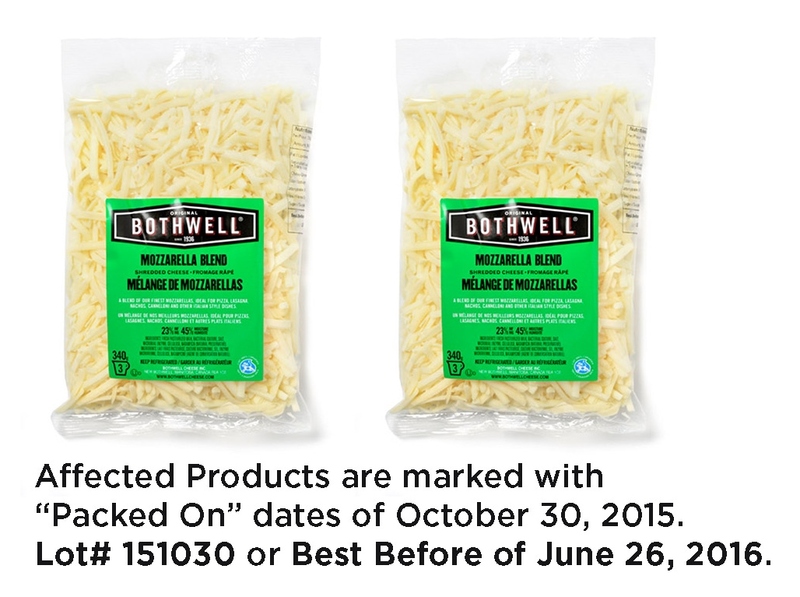 Affected products are marked with “Packed On” dates of October 30, 2015, Lot# 151030 or Best Before of JUNE 26, 2016. The “Packed On” date can be found on the product case label and/or printed directly on the bag itself. Are other Bothwell products affected by Listeria? This recall pertains only to the above listed products. What should you do if you’ve purchased one of these products? For Customers: If you have purchased one of the products listed above, do not consume it. Rather bring it back to the store where you purchased for a full refund. For Retailers, distributors and food service establishments: We ask that retailers, distributors and food service establishments do not sell or use the recalled products described above. If you have shipped this product to other locations either within your own system or externally, please send this recall notice to them to remove product from sale and use. A Bothwell Cheese representative will be contacting the appropriate people within your organization to complete the recall as soon as possible and make arrangements for product to be returned to our facility. We can assure you that customer safety and health is always top-of-mind. We are working closely with CFIA to ensure this doesn’t happen in the future. For more information, please contact Mike Raftis at 1-204-388-5022 or 1-855-388-5022.